Gurdwara Sahib – (Gurughar) the house of Holy Guru Granth Sahib Ji. The holy book is written, composed and complied by the Sikh Gurus themselves which is worshiped by every Sikh devotee. The Sikh Temple, symbol of freedom and spiritual independence for all devotees. In Sikhism it is a place to meditate, to offer prayers to the almighty – Akal Purakh who runs this whole universe. Every human being is welcomed in Gurdwara Sahib to get blessings of almighty. Gurdwara Sahibs all around the world and many of them do have a relation with History. Historical Gurdwara, as the name defines it is all about the Historical Gurdwaras in India, Pakistan, Bangladesh, Iraq, Nepal etc. The main idea behind this site is to provide all possible information about these sacred places. We are trying to cover every Historical Gurdwara that has a specific relation in the history of Sikhism. The site will have every detail of these Historical Gurdwara Sahibs. The story behind the existence of the same. 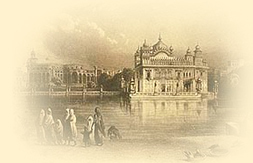 On this website you will find all the relevant information related to these historical places in Sikh history, right from the story to the pictures of the same. Moreover you will find the basic information about Sikh Religion and their ethics. It is a move initiated to spread the message of holy Guru Sahibs to every human being and more importantly it will provide us a platform to share and learn all about these historical places that have played a special role in the history of Sikhism. We all are the children of almighty – Akal Purakh and with his blessings we have created a platform where we can learn about those sacred places that are all around us. NOTE: We are not looking forward to any donations on our name, but would request you to decide at your own by going through the links or by personally visiting these sacred historical places. And if you feel you can do some thing for these places, kindly do the needful. We will always be there to assist you for any help in reaching these sacred places. Our aim is to provide a platform to all such GURDWARA SAHIBS and to be the voice of such historical places which needs attention. GURDWARA SRI GURU NANAK DEV JI. Veroke, Amritsar. GURDWARA SRI NANAKSAR SAHIB PATSHAHI PEHLI SAHIB. Talwandi Sabo. GURDWARA BABA BIR MAL JI ATE BABA DHIR MAL JI. Talwandi Sabo. GURDWARA DARSHANI DEORI SAHIB. Amritsar. GURDWARA SRI GURU TEGBAHADUR SAHIB. Sathiala, Baba Bakala. GURDWARA SRI JANDSAR SAHIB. Talwandi Sabo. GURDWARA SRI MATA GANGA JI SAHIB. Baba Bakala. GURDWARA SRI NANAKSAR SAHIB. Sathiala, Amritsar. GURDWARA SRI BUNGA SAHIB PATSHAHI CHEVIN. Sathiala, Baba Bakala. GURDWARA SRI GURUSAR SATLANI SAHIB. Hoshiarnagar. GURDWARA GURUSAR PATSHAHI CHEVIN SAHIB. Madoke Brar. GURDWARA SRI PATSHAHI PEHLI, Sunam, Sangrur. GURDWARA SRI PATSHAHI CHEVIN ATE NAUVIN SAHIB. Ghanur Jattan, Sangrur. GURDWARA SRI PATSHAHI NAUVIN, Lehal Kalan.